Seven will proceed with a telemovie of The Doctor Blake Mysteries but without its title star, Craig McLachlan. 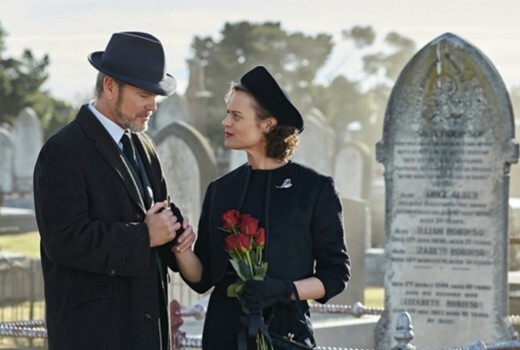 A 90-minute telemovie, retitled as The Blake Mysteries, will see Doctor Lucien Blake disappear in mysterious circumstances, with housekeeper & new bride Jean Beazley (Nadine Garner) to take on a more central role. News Corp reports Seven, December Media, ITV Australia and Film Victoria decided to proceed to ensure it could retain the cast including Garner and Anna McGahan. Not continuing would have seen options on cast lapse. McLachlan has reportedly given the new telemovie his blessing. Whilst McLachlan has been cleared of any wrong-doing by producers, he is continuing with a defamation against Fairfax, ABC and actor Christie Whelan-Browne. “This is a quality show which is incredibly popular with Australian viewers and employs so many talented cast and crew,” a Seven spokesman said. Four telemovies have been planned by Seven. This week the December Media drama and star Craig McLachlan were both awarded in the New York Festivals Film & Television Awards. I am looking forward to the new telemovie and show. I think Nadine Gardner will do great in her new role. Also, I think it is in it’s own way, paying homage to Craig and his character. If it is done well, it will be a natural progression, and I can see how Nadine would not stop at anything to know and find what has happened to her husband, and using all she has learned from her husband and the “usual” characters that have been his background help in solving mysteries on the show, with finding her husband played out in the background. Still hoping,and leaving room for Craig to step back into his shoes as Dr. Blake. So it is going to be renamed “The Jean Beazley Mysteries”? Will anybody remind them what a terrible idea Mrs Columbo was, after Columbo was axed? Oh my gosh. It’s like having a James Bond movie without James Bond or something similar. Hopefully it’s like a one off and Craig can come back for the next stories. I love this idea! Jean, having lived for so long with Lucien and observed how he works, would have picked up a lot of his observations and nous. Forced on the defensive, Jean would have to dig deep into her mind and into what she knows of Lucien’s mind to solve the mystery. And as the story says, it’s just one movie. Not watching without Craig ! Will not be the same without Craig. This will be like Mork and Mindy without Mork. Laurel and Hardy without Hardy. I wont be watching it but I am sure Ch7 wiill find a way to turn it into a reality TV series. They should just bite the bullet and have Craig in the show and let the viewers decide. I don’t want to speak for him, but probably not in a focussed state right now. I’m a big fan of the show. This is a terrible idea. I don’t want to watch it. Without Craig McLachlan there is no show. My instincts are telling me this is a move to buy more time and keep the project alive. In theory it should be ok for one episode and then hopefully it can regroup. The alternative would have been worse. Perhaps they could treat it like a spin-off movie, in which case it should have a different title. Maybe they could call it “The Mrs Blake Mysteries”. This might be a little bit more palatable. It does have a different title. I think The Blake Mysteries is just confusing though. The Mrs Blake Mysteries would be clearer. House of Cards without Kevin Spacey has more credibility than making The Doctor Blake Mysteries without Craig McLachlan who is the heart and soul of the show, I think the producers should have bitten the bullet and finished things while they were on top. *sigh* What a terrible idea. Just let the show die. Seems to me it’s a smart move. Cast and crew keep working, which they clearly want to do. Best case scenario, court action is resolved and Craig returns to an ongoing project which is alive and well. Worst case, Craig drops out permanently and the producers then decide if the other three telemovies are viable. I really like Nadine Garner and her character Jean but this is ridiculous…. it can’t be Dr. Blake mysteries without Dr Blake.